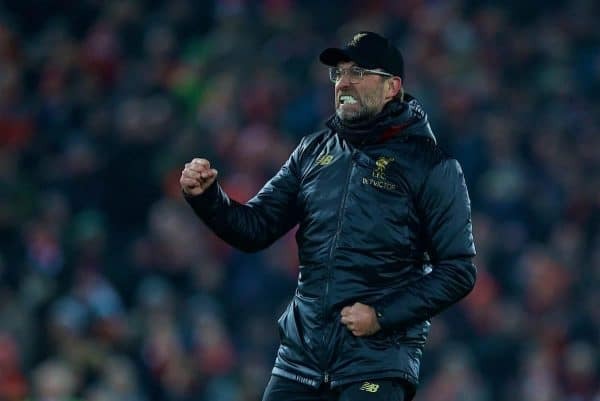 Liverpool were perhaps fortunate to win 4-3 over Crystal Palace on Saturday, but this is precisely the manner in which Premier League title races are won. Some games are so ‘out there’ that it feels like they should be reclassified as ‘full moon games’. Fortunately, full moon games are worth six points when it comes to the battle of the mind. 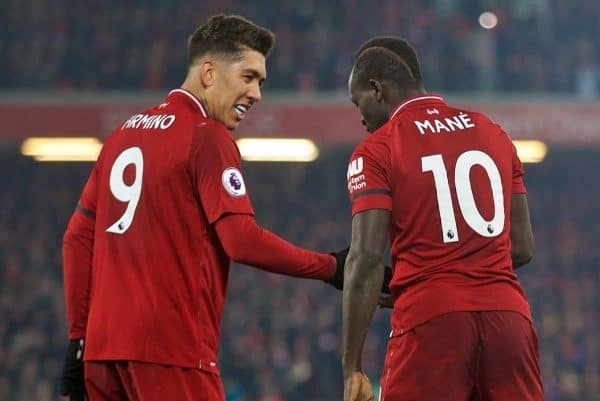 This win will hurt those who harbour designs of catching us in the final straight of the Premier League title race; a list of title rivals that is increasingly looking like it now has only one name upon it. As Chelsea continue to stumble, as Tottenham continue to struggle for a missing ingredient or two while fretting over their injured ‘national treasure’, the field of viable champions begins to definitively thin out. We’ve been on the opposite side of this coin many times before over the last 29 years. Just within reaching distance of the team at the top of the tree, when you witness them being ‘gifted’ a large slice of luck, be that an outrageous deflection, a contentious refereeing decision, or an undeserved victory when they are clearly on an off-day. When you are in this position, and it is your turn to go out on to the pitch 24 hours later, it puts added pressure on you to win your own game, even if that is a game you are roundly expected to win. It almost becomes a thankless task, simply to maintain the status quo in which you approached the weekend. It chips away at the soul; it begins to erode hope. You question your capabilities. You make your own luck when you are a team in the ascendancy, however. You must be there, with attacking intent, to provoke that deflection from an opponent who is throwing himself across a shot in desperation. You need to be attacking with great speed for the officials to miss a ball making contact with a hand during a frenzied build-up to a goal. There will also be times where the luck goes against us though. Like the ball making contact with Andros Townsend’s arm shortly before Crystal Palace scored the opening goal in this game. It’s all about how you respond to the harsh knocks. When the sky is the limit, you brush these knocks aside and bludgeon on to claim the points on offer. Man flu has descended. On only two other occasions have I felt as ill at a football match as I did on Saturday. One was at Molineux against Wolves around 15 years ago, when I was in attendance for a lesser-spotted Bruno Cheyrou goal, during a dispiriting 1-1 draw. The other was at Newcastle United one Christmas, in blizzard conditions, on a night when for most of the journey up to St James’ Park we were led to believe the game would be postponed. 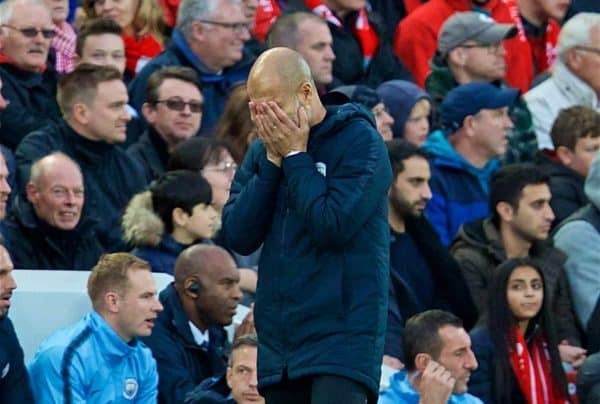 Sat at Anfield on Saturday, almost zombified due to illness and stupefied by the near ludicrous nature of the game unfolding before my very eyes, I was also sat next to one of those people who nervously bounce their leg up and down. You know what I mean by that don’t you? Heel raised from the ground, while using their toes like a springboard. Done quickly enough, with both legs, then they can end up looking like they’re riding an imaginary bike. Anything other than a win and I’d have sneezed all over him. A cluster of five Liverpool players surrounding James McArthur. It made the pitch big for Palace once he managed to evade being dispossessed of the ball. It was Palace’s first attack of the game, but it was a clever one. We provided the space for the opportunity, but they still had to take advantage of it. Wilfried Zaha easily circumnavigated James Milner for the first goal. We had been sleepwalking up until the half-hour mark but we had seemed to be wrestling the control of the game before Palace rudely obtained the lead. 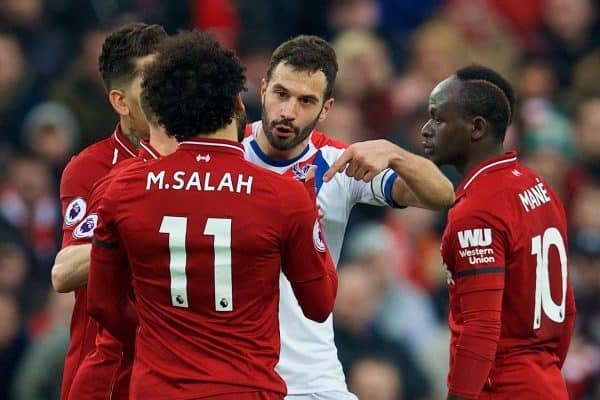 When moral indignation kicks in over attacking players trying to ‘cultivate’ a decision in the penalty area, football drifts into pantomime villain mode. The dark arts of defenders in trying to stop attackers go unconsidered. It’s all about the ‘flashpoint’ when player hits floor. The bigger running battle is ignored. Football could do with greater honesty across the board, but it will never happen because it is a competitive environment. 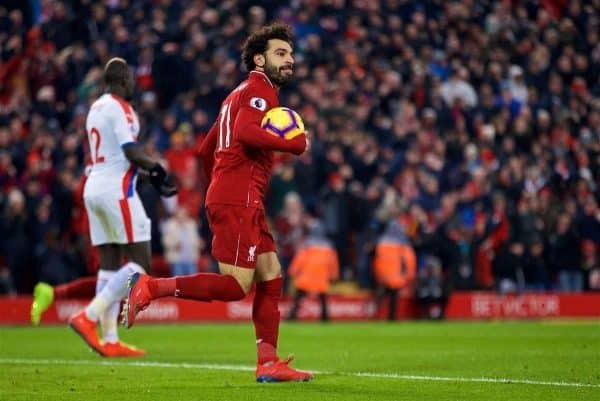 Salah will be vilified more than an entire club will be for distorting the laws of FFP. Proportion is generally in low supply when it comes to views of football. Villainy is in the eye of the beholder. Bernard Sheridan went to his first game in 1923. He saw Elisha Scott play. How mad is that? Put us through many more like this one and I don’t think many of us will be matching Bernard’s 104 years. Yes, luck was involved in the equaliser for 1-1. Defensive panic, a pronounced deflection from Virgil van Dijk. 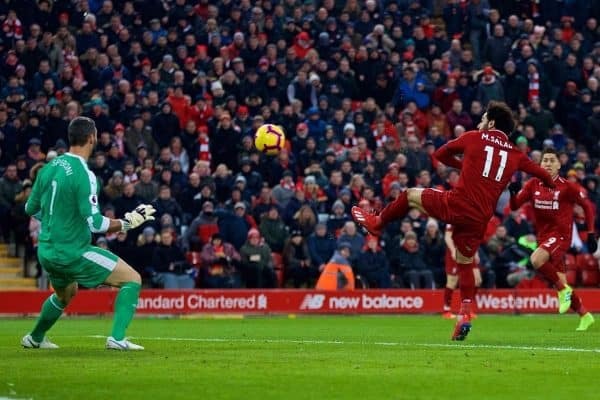 While from the distance of my spec in the Upper Main Stand, it looked like Salah toe-ended the ball past Julian Speroni, according to Danny Murphy, it was instead an intelligent finish with the outside of his foot. Either way, at this point in time of the Premier League title race, who cares what the thinking, intent or aesthetic qualities were? The fact that the ball went over the line was more than enough to provoke my joy and relief. A frustrating first half had left me demanding, but not necessarily expecting, an early goal at the start of the second half. I’d mused with my dad shortly before the restart that if Palace curled up into a ball, then we would find it difficult to break them down. Not allowing them the time to get into their rut was an ingenious move. Within eight minutes of the restart we had sprinted into a 2-1 lead. With the aid of another deflection, Bobby Firmino scored. That song of his is nothing but glorious. But we were careless to concede the equaliser for 2-2. Milner was given a torrid time by Zaha, yet he played a pivotal part in our third goal, another goal that benefited from an aberration of the mind of a Palace player; this time Speroni was startlingly culpable. 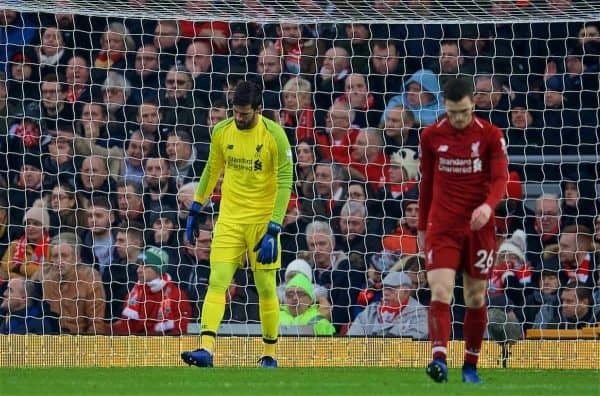 If we do win the title, then we will owe a huge amount of thanks to goalkeepers freezing beneath the shadow of the Kop. 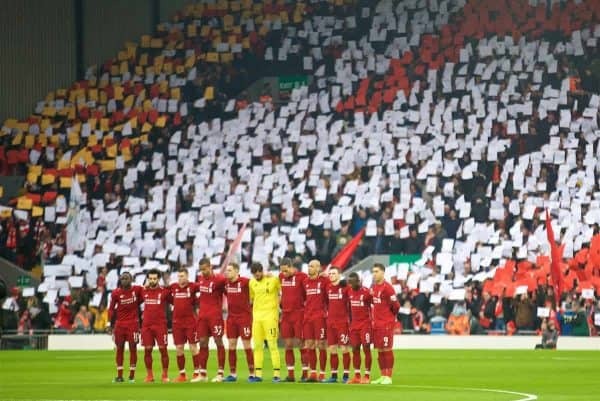 Banners of thanks to Speroni and Jordan Pickford will be a must. Milner is no right-back, certainly not against someone a fast as Zaha. I felt we would have been better served by swapping Milner and Fabinho around. 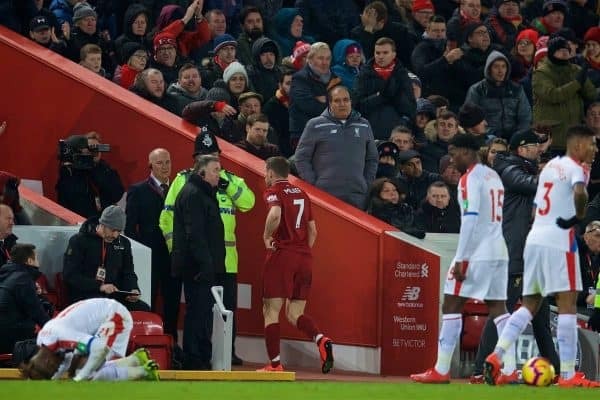 Sent off, Milner knew he was going as soon as he launched into the challenge. Jordan Henderson had played well, but his pass meant Milner was always half a second behind the ball. That said, the pass was intended for Firmino. 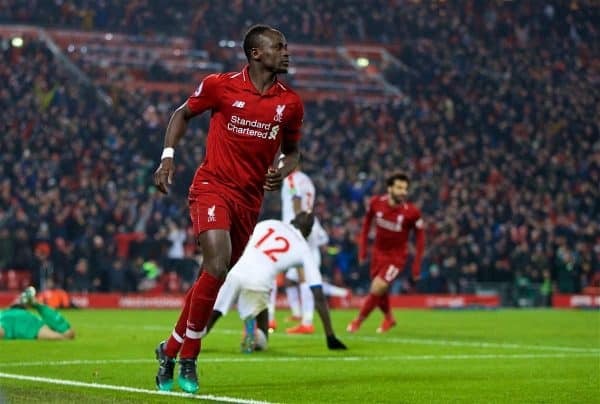 Our good fortune still didn’t desert us however, as Andy Robertson used his hand during the buildup to what proved to be a vital fourth goal, one that was excellently finished by Sadio Mane. It was the goal that gave us the scope to concede one more. Three league goals shipped at Anfield on one afternoon, when we had previously only conceded three all season. The moon was indeed full. Roy Hodgson, another to have recently aided and abetted us in our title challenge by leading Palace to victory at Man City, was bitterly disappointed. We have 60 points with 15 games to go. We are 13 points better off than we were at this stage last season, 15 goals better off in terms of goal difference. 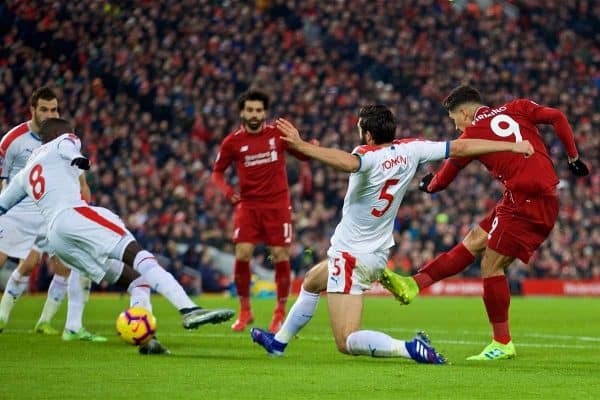 Another ‘winter break’ now presents itself and this is where we can see the ups of the downs of being out of the League Cup and the FA Cup, as those behind us are stretched in four different directions. Come back energised and focused though, because Leicester will be afforded the same amount of time to regroup too.